In 8-inch nonstick skillet, melt butter over medium heat. Stir in bread crumbs; cook 6 to 8 minutes, stirring constantly, until golden brown. Remove from skillet; set aside. In medium bowl, mix cream cheese, 1/2 cup of the Caesar dressing, 2 tablespoons of the Parmesan cheese and the lemon juice. Stir to completely blend; spread in 9-inch glass pie plate or other shallow serving platter. In small bowl, mix chicken and remaining (about 3 tablespoons) Caesar dressing. 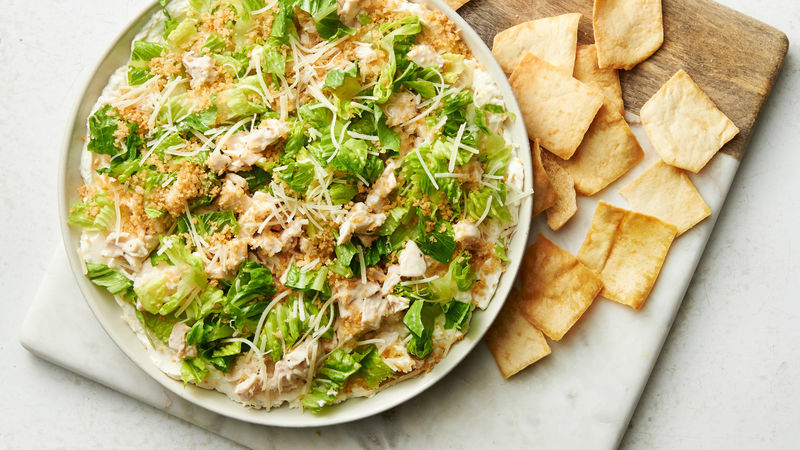 Top cream cheese mixture with chicken and chopped romaine; sprinkle with remaining 6 tablespoons shredded Parmesan cheese and bread crumbs. Serve with crackers. If transporting this dip, pack the bread crumbs separately, and top dip just before serving.